This blog post is a look how I automated most of my personal tasks when working with NodeJs and NPM. I strongly agree with Kent C Dodds and his list of reasons to automate even the smallest manual tasks. Investing a little time to write a tool that saves us a few seconds might seem like an unwise investment. Yet for me, each tool saves a lot more than a few seconds - it helps eliminate unnecessary distractions while I concentrate on the task at hand. Here are the tools I wrote that I use over and over, hope they could be useful to someone else too. Give them a try, file an issue if you find a problem and spread the word by giving a tool a github star, or by tweeting about it. Before proceeding, if you decide to install any of these tools, consider using all-nvm to install. This way the same tool will be installed in all Node versions on your machine, if you use NVM to manage multiple Node versions. I often have to lookup how to use a particular NodeJS module. Typically this means npm home <module name> which opens a browser page, then looking or searching through the page to locate a particular example. Opening a browser just to find some text seems like an overkill, thus I wrote manpm. It looks up the README for a given package and searches text inside to find the relevant section. I became so lazy nowadays, I even search the local README file in the current folder! The search only prints the found section, allowing me to lookup the information without loosing focus. If an NPM package follows all the best practices, it will have a lot of properties in its package.json file. For example, the manpm package.json file is 99 lines long. Printing this file in the terminal to find a particular value means scrolling and searching. The tool looks for the unique property that matches the prefix, and tries to be helpful if there is nothing matching or several results. "nr t" === "nrun t" === "npm test"
"nr m -w" probably will find "npm run mocha -- --w"
The tool tries to be helpful, just like json-package. If the supplied prefix matches more than a single script key, it will list the choices. running command with prefix "s"
running command with prefix "si"
This is not my tool, but I use it for most of my projects to automate the npm publish command. Instead of making a decision which semver number to increment and when to publish, my CI does that. All I need is to follow a simple Git commit message format, and the rest is automated, including the beautiful and useful release notes, see example. If the semantic release command that runs after the unit tests pass finds type feat it will publish a new version under version x.y + 1, z where x.y.z is the latest published version in NPM. If the commit message has fix(...): ... type, then it will be published under x.y.z + 1. Finally, having BREAKING word in the full message body will increment the major x + 1.y.z version. By automating this pipeline I completely eliminated waiting for CI unit tests to finish, modifying and committing the changed version in the package.json, etc. It is a pure bliss - just work on the code, and let the machines worry about versioning. If you use a private CI instead of TravisCI, I implemented a plugin for CircleCI, other CI services can be done similarly. Also, there is a plugin for reliable release if your project is tested via a matrix of NodeJS versions. available-versions - what new versions are there? When you automate your publishing commands like I have done, all of the sudden your productivity will sky rocket. Every push, every commit can become a new published version. This causes a tiny problem: if I am working on the downstream project, it is often that there are newer versions. How to quickly find what new versions can I use? Using npm info <package name> is bad - it will spit hundreds of output lines, and I will have to scroll back to find all available versions. For example, because of its extensive list of contributors, lodash information is 748 lines long! Finding all versions of lodash released after 3.0.0 version is a pain. This is where available-versions shines. Quick and simple. And if I want to upgrade to a newer version without breaking my code or testing it manually, I recommend using next-update of course. I often do demos and presentations. 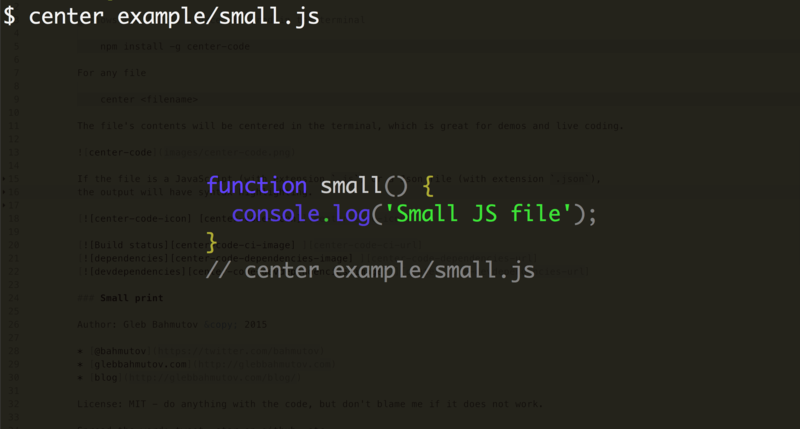 Often I need to show a small piece of code in the terminal, be it source code or package.json or some markdown file. A large font is helpful, so is clearing the terminal before showing the source. But I needed to make sure the code is using the screen efficiently; instead of hugging the left margin of the terminal, I needed the code to be in the center.